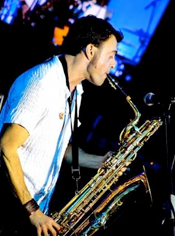 Israeli multi-instrumentalist Amir Gwirtzman has performed worldwide as a solo jazz musician and a member of the acclaimed Israeli world music band Esta. He’s an articulate, engaging speaker who recently gave concerts and taught in 21 U.S. cities with Esta. Amir will perform, teach and speak the American South from February-May 2010 as a Schusterman Visiting Artist – a program of the Charles and Lynn Schusterman Family Foundation – in partnership with the Goldring/Woldenberg Institute of Southern Jewish Life. Amir is a master of saxophone, clarinet, flute, bagpipes and a woodwind section full of African, Asian, European and Middle Eastern instruments. He offers an excellent opportunity to enjoy the sounds of Israel, to share Israeli and Jewish culture and to learn about music from across the globe. Pictures and information about Amir are from www.isjl.org.